The region that was to become the park was studied by Increase Lapham who surveyed ancient works in the Milwaukee Area from 1836 to 1852. His map indicates that there were Indian mounds along the west bluff of the Milwaukee River, just south of the present day Capitol Drive, but show nothing within the boundaries of present day park. There is one report on a Native American artifact, a large rock with a couple of deep grooves which may have been used for grinding grain. It is located at the south end of the park near the stone comfort building. The first reported permanent settler of the park area was Thomas Bare who, in 1841, purchased 90 acres of land east of the river and north of Capitol Drive near the Channel 6 tower. In 1873 J.R. Berthelet discovered some mineral deposits near the site of the construction of the North Avenue Bridge that intrigued him. It was found to be a limestone with a heavy clay component which made it a natural hydraulic cement found only in a few locations in the Midwest. Berthelet went hunting for the source which he found in an outcropping by a low lying meadow on the east bank in what is now the park. In 1875 he and his associates formed the Milwaukee Cement Company, purchased the land and built a mill. The miners dug quarries and also tunneled under the bluff to extract the limestone. These tunnels may have been the source of sink holes that developed in the park later. As the Milwaukee Cement Company grew it needed more buildings to accommodate workers from out of the area and constructed a boarding house. In the 1880’s Berthelet and company bought the property on the west bank of the river and set up a second mill, probably near the remnant of the “blue hole”. A railroad bridge was built just a few feet over the river. In 1889 George Brumder started the Cream City Cement Company on the other side of the river, but was bought out by the Milwaukee Cement Company. Around the turn of the century there was a revolution in cement production with the introduction of the rotary kiln that produced “Portland Cement". Portland cement was cheaper to produce, could be made from different materials, and produced a better product. The Milwaukee Cement Company suspended production in 1911. The mills were burned, the kilns were destroyed, and 350 acres on both sides of the river were put up for sale. Estabrook Park was named after Charles E. Estabrook who grew up in southeastern Wisconsin and became a distinguished lawyer and politician. He moved to Manitowoc in 1871 and served for three terms in the State Assembly as well as two terms as Wisconsin Attorney General. In 1893 he moved to Milwaukee from where he served two more terms in the Assembly. He was instrumental in enacting laws that provided social centers for farmers, that prohibited sweat shops and that authorized the Milwaukee County Parks Commission. He served on the commission until his death in 1918. The park was established in 1916, although initially it did not achieve its present expanse in the communities of Milwaukee, Whitefish Bay and Shorewood. That year, eighty-three acres of land where acquired for the park with further acquisitions later until 1931. The County Park Commission completed a topographic survey and preliminary layout survey of the park in 1924. A parkway, the first in the Milwaukee River Parkway system, was constructed in 1927 in the park, as were improvements (athletic fields, picnic area paths, bridges and a bridal path around 1929). Relief workers constructed the comfort stations and the service building in the early 1930’s. 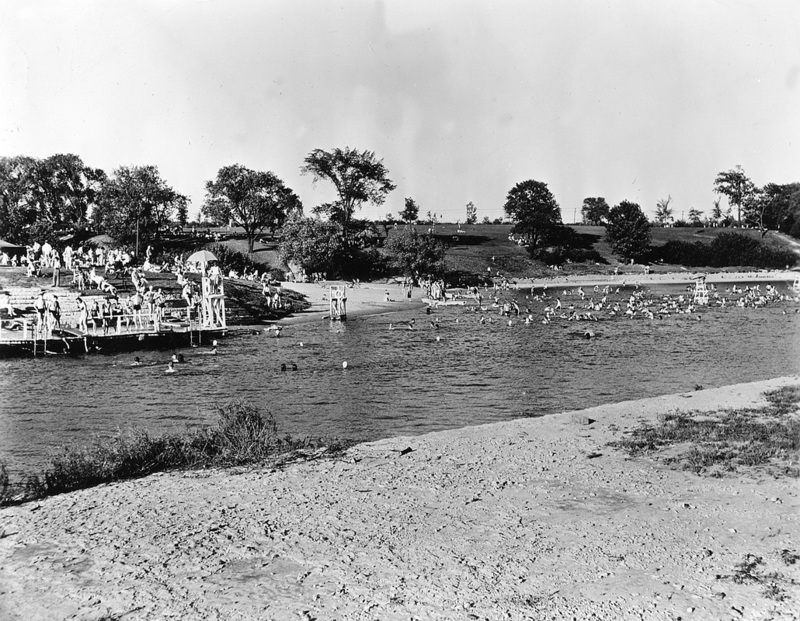 In 1931-32 relief workers constructed the lagoon and built a bathing beach on the river with a temporary beach house. The site of the beach was at the end of the ravine just south of the present "dog park". It was closed in 1941. The Civilian Conservation Corps established the Estabrook CCC Camp in Lincoln Park and operated from 1934 to 1937 building stairwells, paths, and fence lines in Estabrook. The CCCs also cleared a 1500 foot rock ledge on the river and then constructed a dam in that location. The island in the river between the two constructed parts of the dam was part of the north shoreline before dam construction. The dam eventually fell into disrepair and was recently removed in 2018. The Benjamin Church House, originally built in Kilbourntown in 1844, was disassembled in 1937 and moved to its present site near the south end of Estabrook Park where it was reassembled. 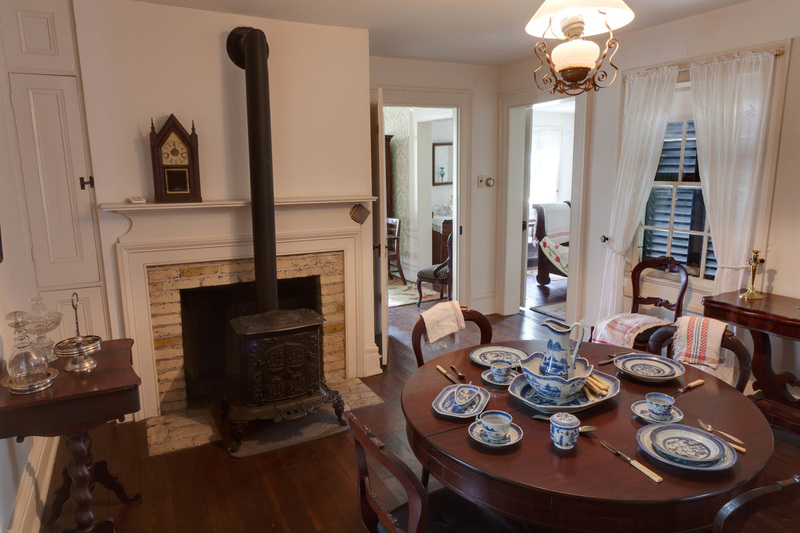 The house is furnished with period era furnishings. Later developments included the installation in about 1940 of the pedestrian underpass near Wilson and Congress and in about 1955 the construction of “sharks teeth” above the dam gates were added to break up ice. The "sharks teeth" were removed at the same time as the dam in 2018. Beer gardens in parks and along the Milwaukee River were a big part of the German culture in Milwaukee from the 1860s until Prohibition. Historically, there never had been a beer garden in Estabrook Park, but when the first beer garden in Milwaukee since Prohibition was established in 2012, it was set up in Estabrook Park. Its success has led to the establishment of several more park based beer gardens. The last few years have seen many changes in Estabrook Park – the beer garden, the dog exercise area, the disc golf course, and new trails – that have increased park attendance and made Estabrook Park a popular destination. However the true value of the park lies in the natural/urban wilderness experience it provides.